Customer satisfaction is a top priority for any successful business. Making excellent customer service a top priority ensures that satisfaction and gives your business a competitive advantage. Top-notch customer service, however, is easier said than done. It takes thinking outside the box and sincere intentionality to go above and beyond average. It’s one thing to say you’ll get back to a customer as soon as possible; it’s quite another to actually prioritize that customer and get back to them sooner than they’d expect. The ability to record every call within your organization is the ultimate tool for customer service improvement. The analytics alone can give business owners and managers valuable information to help determine what’s working, what isn’t, and where extra training might be in order. Being able to review an entire call gives your team a clear picture of your customer service in action. These calls can be used in training sessions or as an evaluation tool. Call recording helps to prepare new staff for their launch into the world of customer interaction. The Auto-Attendant feature is a powerhouse, accomplishing various tasks automatically. This virtual assistant can answer the phone with a customized message and redirect callers to the appropriate person in your organization. No more dropped calls due to long hold wait times. Customer calls are answered every time. Callers are immediately directed to the person who can best serve them, reducing call transfers and having to repeat their requests each time. Busy business owners and other staff can stay focused on the task at hand, knowing that all calls will be answered, and they will only need to take a call if their own line rings. Even with Auto-Attendant, there will still be times when a member of your team is unavailable to speak on the phone. But keeping up with voicemail messages can be time-consuming and overwhelming. Salespeople can’t afford to keep customers waiting. Voicemail-to-email makes staying on top of your voicemail manageable. Your work voicemail is linked to any email of your choice. Voicemail messages are transcribed and forwarded to your selected account. The time saved by the ability to quickly skim through messages in this way is invaluable. Salespeople can see all messages at a glance and easily forward or delegate messages that can be handled by someone else. Excellent customer service is crucial to sales success and customer retention. 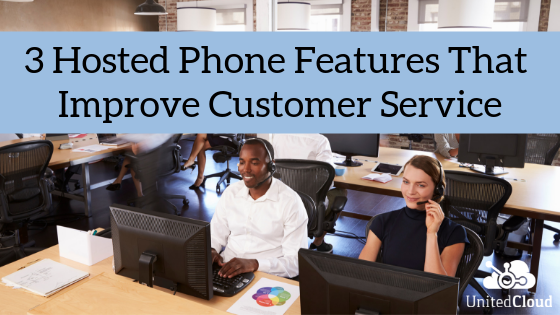 The features provided by a hosted phone solution are tailor-made for the kind of customer service that can set you apart from your competitors. UnitedCloud is committed to helping your business succeed. Contact one of our hosted phone specialists today to learn more about a communications solution that can make your customer service better.